Russians put the flowers near the French Embassy in Moscow. Both the president and the prime minister of Russia have made robust statements condemning the perpetrators of the terrorist attacks in Paris on Nov. 13, in which at least 127 people have been confirmed killed. "This tragedy is additional proof of the barbaric nature of terrorism, which is posing a challenge to human civilization," said Russian President Vladimir Putin in a telegram of condolence addressed to his French counterpart Francois Hollande. "Russia resolutely condemns these inhumane killings and is ready to render any assistance in the investigation of these terrorist crimes," said Kremlin spokesman Dmitry Peskov. Ordinary Russians too are expressing solidarity with the people of France. People began coming to the French embassy in Moscow overnight, bringing flowers, candles, and notes bearing words of support. 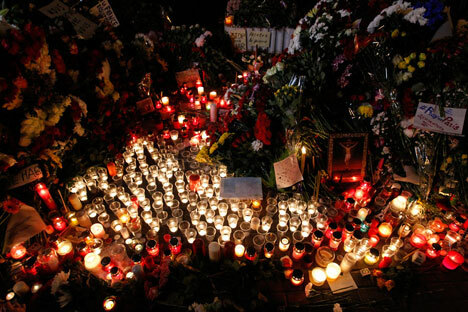 By the morning of Nov. 14, there was an improvised memorial at the embassy gate. A series of coordinated terrorist attacks took place in Paris late on Nov. 13. According to media reports, the Islamic State (ISIS) extremist group has claimed responsibility for the attacks. Francois Hollande has declared a state of emergency. One common thread in the statements of condolence from Russian politicians has been the need to join efforts in the fight against terrorism. Konstantin Kosachev, head of the Federation Council's international affairs committee, said that "Russia's political will consists of" proposing to the international community the broadest possible cooperation in the fight against terrorism without any preconditions. Meanwhile, a fellow senator, first deputy head of the Federation Council's defense and security committee Frants Klintsevich, suggested that the international talks on resolving the Syrian conflict in Vienna on Nov. 14 may discuss the idea of "creating a broad anti-terrorist coalition.” The Russian and U.S. foreign ministers are already in Vienna. Speaking ahead of the talks, Russian Foreign Ministry official spokesperson Maria Zakharova said that the events in Paris may affect the atmosphere and the course of the Vienna meeting. "It is necessary to do everything to show our solidarity for real. Solidarity is the key word today," she said. Meanwhile, Chechen leader Ramzan Kadyrov called on the leaders of Muslim countries to unite in the fight against ISIS. “This evil must be rooted out,” he said. “Otherwise, swarms of terrorists, like mud flows, will pour into all the countries and cities of the world. We once again urge the leaders of Arab and Muslim countries to unite their efforts against Islamic State," he wrote on his Instagram page. Following the events in Paris, politicians in Russia also call for tightened security, especially in the light of the recent threats against Russia from ISIS. "Let's step up the fight in all areas and then you will see a good result. Given what is happening, all security measures must be stepped up to the maximum," the leader of the Russian Communist Party, Gennady Zyuganov, told the TASS news agency. A member of the State Duma's security committee, Boris Reznik, also said that the Russian authorities should adopt extraordinary measures to tackle the threat of a terrorist attack. "First, all security and law-enforcement agencies should be put on high alert. All of us too must be vigilant, it is necessary to raise people's awareness, to train them how to behave in crowded places. There must not be any carelessness on the metro, at airports, at facilities representing particular danger," he told the Kommersant FM radio station. Meanwhile, senator Yevgeny Serebrennikov said that the Federation Council may discuss the issue of introducing additional security measures in Russia during its session on Monday, Nov. 16.